After the Storyboard class I took with Steve McLeod and CGMA (they just made some changes to the website), I have become more and more interested in Story and screenwriting. During the introduction class, Steve told us about the classic Robert Mc Kee and Syd Fields books, and this other book I had never heard of before, “Save the cat” by Blake Snyder. “Save the cat” was on my to-read list for a while and I was finally able to go trough it during my recent trip to L.A. Man this book is awesome. It is so awesome that after reading a dodgy Pdf version on my Kindle, I had to run to the nearest Barnes&Nobles to buy the paper version as soon as I landed. Agreed it seems very formulaic with the various page count, but make abstraction of this and you will definitely learn a lot. The book was an eye opener for me and thanks to Blake Snyder, I am now able to clearly understand the structure of movies and even understand some screenwriting insiders joke like the “Save the cat” sequence on Pixar’s “Incredible”. 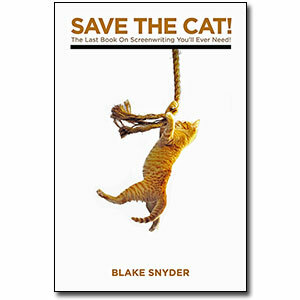 If you ever wanted to write a script and didn’t know how to start, “Save the cat” will certainly be of a great help.